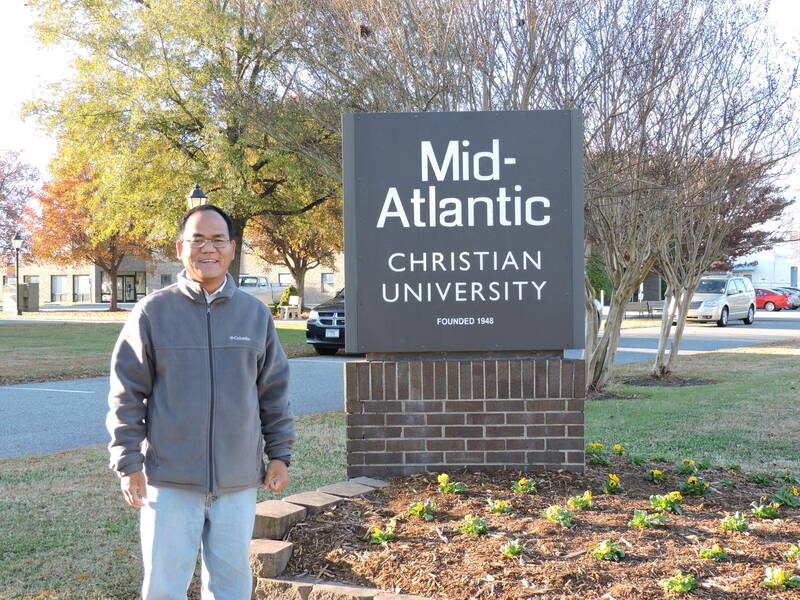 Mid Atlantic Christian University hi America gam North Carolina State, Elizabeth City a um ahi. MACU hi 1948 kuma ana ki phut doh ahi. Pathen gonpeh jal in, November 18-20, 2014 sung in ka ga cham in, Chapel a thuseina leh Mission class hoa thuseina leh thuhilna ei peuve. Anoiya hin ka kholjinna thu bukim deuh in ka sun doh e. Asim jouse Pathen in vang boh ta hen! 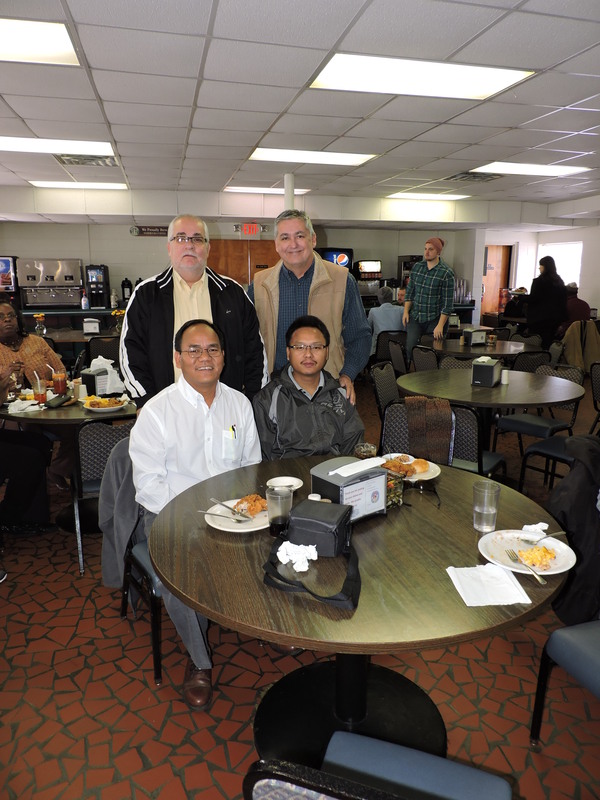 On November 18, 2014, ni jing kah lam pung 7:15 am vel in Chesapeake a cheng Mr Bill Holmes in ka zin lhunna Red Roof Hotel a ei hung lan Mid-Atlantic Christian University (MACU) lamche din ka kon doh lhon e.
Shoney’s Restaurant muna jingkah an (Breakfast) va set in ka ne lhon e. Hia um sung lhon in, Hotel a kapung kada lhah ka hin gel doh in, an neh jouvin Hotel ka nung che kit lhon in, pung ka ga la lhon e.
Jing kah lam pung 8:00 am in Chesapeake , VA a kon in ka kon doh lhon in, jing kahlam 8:45 am vel in Elizabeth City, North Carolina State ka lhung lhon e. MACU ka lhun lhon in Bill aki nung le tai. MACU ka lhung in, Associate Professor Dr Claudia Divino office ka ga chen, ka ga kimuto pin ka hi. Ama toh ka ki mu to jouvin, MACU Chapel ka kai khom uve. Hiche Chapel kikhopna chun thuseina phat, minutes 7 vel ei pe un, hia chun USA gam ka jinlona thu, Myanmar gamsung thu, leh natoh thu ho chomchan ka sei ye. Chapel kikhop chaiyin, Mission class khata minute 45 sung thuseina phat ei peuve. Chujouvin sun an (Lunch) ka neuve. Sun an neh jouvin, Mission Class khat a thu eisei sah kit uve. November 19, 2014 ni jing kah pung 11:00 am a kon in sun 12:30 chan Cross-Culture Mission Class khat a thuseina leh thuhilna phat ei pe kit uve. Hiche class kichai hin MACU President pu Dr Clay Perkins, Dr Divino, Myanmar gam kon lekhasim student khat toh sun an (Lunch) ka ne khom kit uve. Sun an neh jouvin, MACU library a ka ga chen, Library Director Ken Gunselman in eilam ton, Philippines gam a Pathenna ana toh thu aseiyin, chujouvin Library den thum sunga study bolna ho ei vet sah lei. MACU library a lekha bu copy val ho man lhom chan ajoh un, hi ho chu ka sun vet in, ka sim in, ahoi thei lheh in bu 8 ka ki choh e. Bu khat $ 1 a ajoh u ahi. MACU Library a ka lekha bu choh ho: 1. PERSPECTIVES: On the World Christian Movement, 2. Kingdom of Priests, 3. A Harmony of the Gospels, 4. Introduction to the Restoration, 5. Houses that Change the World, 6. The Early Church History, 7. Europe’s Reformations (1450-1650), and 8. the Life & Ministry of Jesus Christ ($ 1 per a book). Very good resources! I love reading them very much. November 20, 2014: Bill Holmes ma man MACU campus a ei hung la kit e. MACU campus pan jing kah lam 8:30 am in ka kon doh lhon in, Shoney’s Restaurant a Breakfast ka ne kit lhon e.
Bill Holmes hi US Air Force leh VA Police a kumsot tah Sorka na ana toh ahin, tua hi kicholdo a Houbung leh Sorkal a dia Volunteer a na tong ahi. Pathen ngai lu mi jong ahi. Hiti chun jing kah lam pung 10:30 am in ka loi pa Tom te chenna in ka lhung lhon e.
MACU ka chena a pha chom chu ahi le Professors, Staff members leh Students ho henga thuseina phat ki changa, chule Pathen thu leh Natohthu ki sei phong thei hi ahi. Pathen in MACU phungvuh jing ta hen!